I got to host a baby shower for Amy's first baby a few years ago, and it was such a delight to get to celebrate her again as she expects baby boy #2! 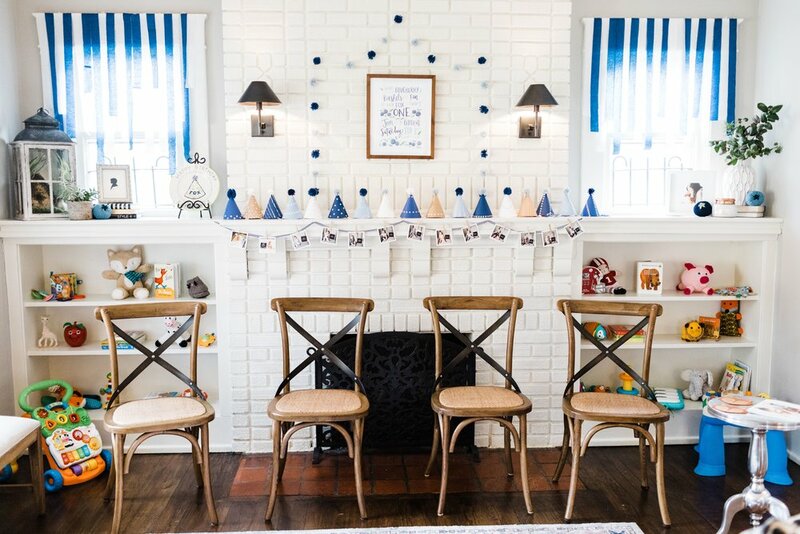 Her shower was planned for June, and we landed on a bright, fun, summer theme. We wanted the shower to feel appropriate for the baby boy on the way, yet still feminine for the momma-to-be! Seeing her happy face as she arrived was all I needed to know it was a success! Fruit and bright colors were our inspiration, and I loved incorporating fresh flowers with real fruit pieces in the decor. Ashley found this pineapple slicer and dicer which made is super easy to core the pineapples to use as vases and then of course serve the delicious fruit inside! Just as she did for Fox's birthday, my sweet Momma made custom runners for this event with fabrics I selected. They added a beautiful pop of color, and we used the spare fabric to make fabric banners that I kinda fell in love with. Amy is expecting her second boy, and she had shared this cute t-shirt with us, so we decided to use the phrase from the shirt, "Raising Boys," in the shower decor. It was a simple and meaningful way to personalize the decor for Amy. I feel like in planning this event, I learned a valuable trade secret that I will use going forward for creating menus at parties. If you can make from scratch one to two items, it will add a real wow factor to the entire spread. As I shared in my party planning guidelines, you can't do it all and do it well, and its helpful to find things to outsource. For me, this is often food simply because I do not love to cook, and it's the thing that usually causes me the most overwhelm when party planning. So for Amy's shower, Ashley and I both made one homemade item, a breakfast casserole and mini pancakes respectively. 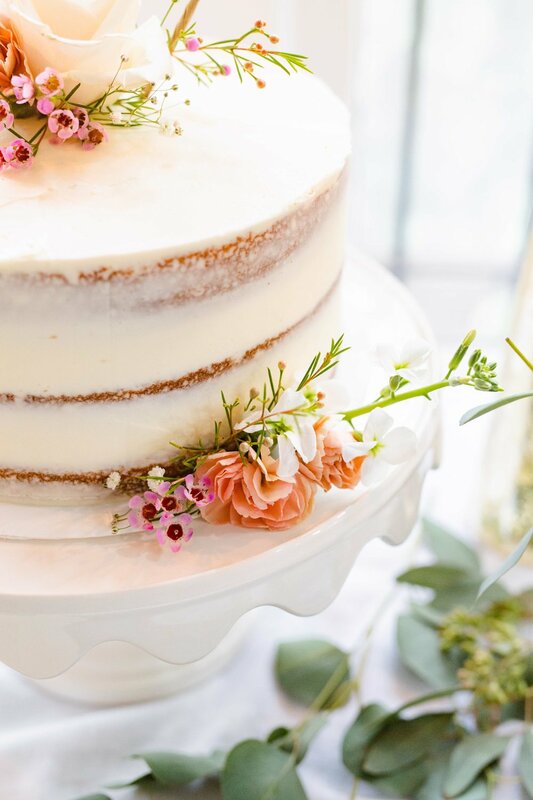 The other items were store bought and tasted delicious, but it was the two homemade items that got the most compliments from guests at the shower. I feel like the quality of the homemade items elevated the entire spread, and my mouth is watering just thinking about it! Another quick and easy decor tip is to select ribbon that coordinates with your theme and tie it around serving dishes. This is so simple, but the extra touch makes it feel more meaningful and intentional, which I just love! It ended up being such a special day, and everyone seemed to have a great time. I love the beauty of flowers and good food and sweet details, but at the end of the day, when people come to an event and feel special, that is the best part of all. It was an honor to get to celebrate this sweet friend and hard-working Momma, and I can't wait to meet Baby Boy Helzer in just a few more weeks! First comes love, then comes marriage, then comes the baby carriage! Most of us have sung this little song since childhood, and sometimes it's hard to believe we're now adults living out its rhymes. With The LovingKind being a love and marriage blog, I suppose talking babies is inevitable! Last spring, I helped host a baby shower for my dear friend, Amy, and it was a truly special day. It's been a year since the shower, and now spring is on its way again, so I thought I'd share our party with you! If you are planning a shower, decorating a nursery, or just enjoy fun event ideas, I hope you find some useful inspiration here. Many of the shower elements were created DIY-style by the hostesses, and are things you could do yourself too! If you see something you like that you want more details for doing it yourself, feel free to ask! Also, big thanks to shower guest and photographer, Ashley, for all these fabulous images of the event! Being the lover of paper products that I am, I was very excited for the opportunity to create a special invitation for Amy's shower, and the other hostesses graciously obliged. Amy and Todd had announced the name of their baby boy, London, and we decided to incorporate it into our shower theme, and it started with the invitation. I illustrated the London Bridge (a nod to London's name and the popular nursery rhyme) along with London's name and worked with Amy's husband Todd, a graphic designer and photographer, to complete the piece. We kept the invitation a surprise for Amy, and it was such a sweet moment when she called me with such sweet, genuine excitement after receiving it in the mail! We also framed a copy of the illustration to use at the shower and to give to Amy to display in London's nursery. It turned out to be a wonderful keepsake from the event. 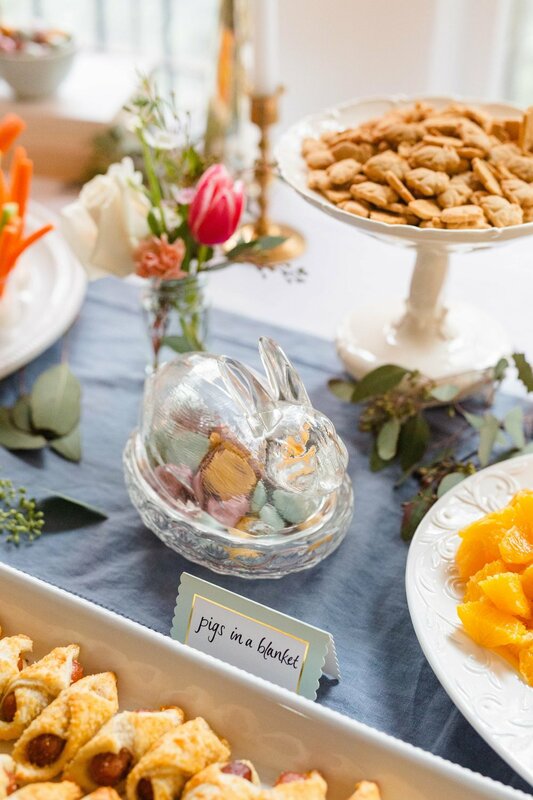 Amy's shower was held at brunch time, and we loved picking out delicious brunch items to offer guests. We served fruit kabobs, orange juice, coffee, mini quiche and mini muffins. These items were easy-to-eat finger foods and were just right for a morning event. In addition, as any Southern hostess knows, you can't have a shower without something sweet! We couldn't resist a festive cake being part of the celebration, and one of the hostesses, Lindsey, selected this darling baby blue one from Edgar's, a popular Birmingham bakery. Also, check out that fabulous doughnut hole tree! In my opinion, there is no better sweet morning delight than a doughnut! The tree was made by Lori, one of the hostesses, and was such a fun and tasty treat for the table! I found a couple great resources to help you make your own: Rachael Ray and Oh Happy Day. One of the hostesses, Ammie, offered her home for the event, and it truly was the perfect location. From the natural light to the colors of her home decor, it was the ideal backdrop for the shower. Ammie also brought in beautiful, fresh elements in the beverages served and the floral touches throughout her home. The orange slices and mint leaves in the water not only looked nice, but tasted fresh too! 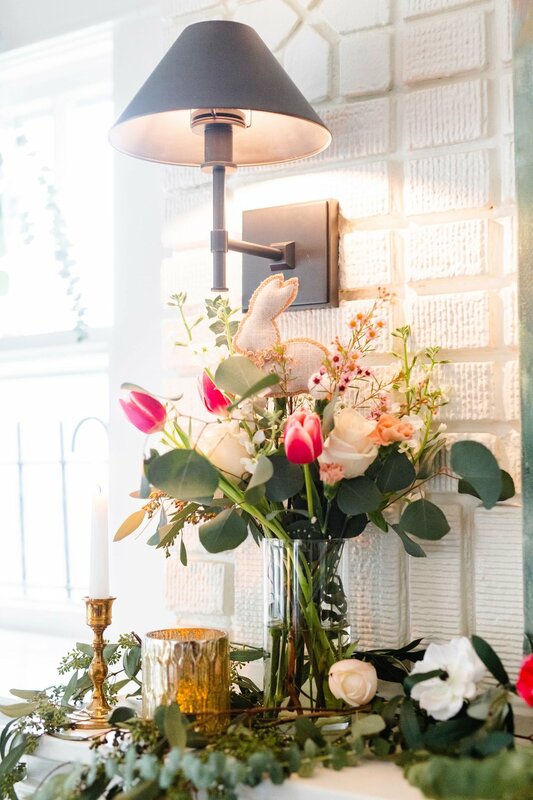 Notice how she kept the flowers simple by only selecting a few types of blooms; this made a beautiful impact without feeling over the top. The colors were bright and happy, just right for an early spring, boy baby shower. One of the first things I always ask parents-to-be is if they are sharing with people the name for their baby. The name parents give their new little one is so special, and I just get so excited! If the parents have announced the name for the baby, personalizing the shower is a really sweet touch. We incorporated this starting with the invitation and continued it throughout the event decor. The cheery, green monogram was made from floral wire, floral tape, greenery and craspedia (commonly called billy buttons). I used the floral wire and tape to create the letters, making loops at the top where I could tie ribbon for hanging. Once I had a letter shape I was happy with, I used the floral tape to attach the greenery and then the billy buttons to the volume that looked right. The finished product was lively and happy, and I love the statement it made hanging in the window! Anxious to put my new calligraphy skills to use, I also made these little flags with toothpicks, scrapbook paper, and glue and personalized them with London's name and monogram. They looked adorable in the delicious Magic Muffins mini muffins and mini quiche we served. We wanted to provide a memory of all the friends who came to celebrate Amy and Todd and baby London, and decided to take a creative route over the traditional guest book. We found this great map of the London Underground Transportation at Paper Source and used spray adhesive to mount it on a foam core board to be used as the guest "book." We loved that we were able to incorporate London's name into so much of the event, and guests enjoyed finding the perfect place to sign their names to create a memory. As Amy put together London's nursery, animals became a theme of the decor, so we wanted to incorporate these into the shower as well. One of the hostesses, Mandy, made these fabulous metallic animal figurines, and they looked amazing! She bought plastic toy animal figurines and spray painted them in metallic gold and silver. They looked so special throughout the shower, and we were also able to send them home with Amy to add to the nursery decor if she wanted. As another tribute to the animals, we got her two Little Darlings prints from The Animal Print Shop as a gift from the hostesses. Also, we gave her a few of the toy animals (pre-spray painted) for London to play with one day! 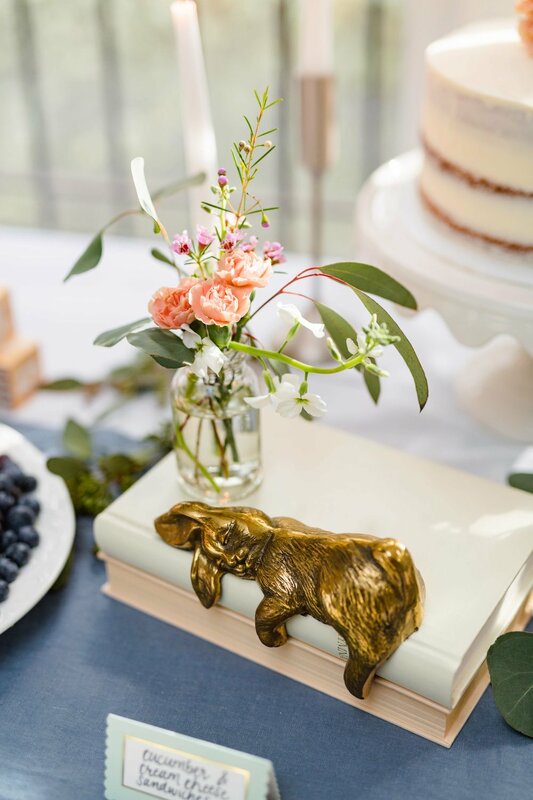 As I look back, one of my favorite things we did throughout the planning was to create special items that were personalized to Amy and London, and that Amy could take home with her to remind her of the shower well beyond the actual event! All of the shower hostesses with guests of honor, Amy and London. At the shower, Amy was surrounded by so many friends who were excited for London's arrival, and we truly celebrated their growing family that day. While all the decor and sweet touches were great, it was the love felt in the room that made the event truly meaningful. It's been a year since the shower, and London is just weeks away from his first birthday! He is one of the happiest little boys, and his parents are beyond smitten with him (I'm sure you can see why!). It has been a joy to be part of his life in this first year, and I can't help but kiss his little cheeks every time I see him. Amy and Todd are great parents and there is so much love in this little family of three. Wherever the baby carriage may find you, as the hostess of a shower or preparing for a little one yourself, may your heart be ever focused on what matters most—the gift of life you are celebrating and the foundation of love you are blessed to be part of laying. I know there are so many great shower ideas out there, and I'd love to hear from you! 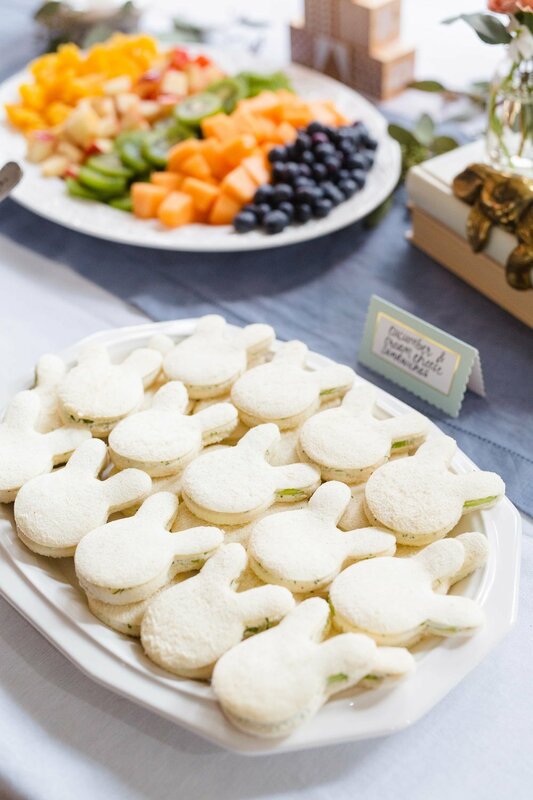 What are your favorite baby shower ideas or tips? Happy Birthday to The LovingKind! I am in total awe and full of gratitude to celebrate this day with y'all. Part of me feels like The LovingKind has always been here, and the other part can hardly believe it's been a year! I am grateful from the top, bottom and every side of my heart to the Lord for the gift of The LovingKind. There is no doubt that it is His heart for love, marriage, and people that is behind all of this. I have learned so much, enjoyed so many new things, and made some amazing connections, and I'm just so thankful He has chosen me to be part of this. Woody hand painted this ceramic heart with The LovingKind logo mark for my birthday. He is self-proclaimed not to be a painter, but what he may lack in skill, he makes up for with loads and loads (and loads) of heart. I love him so much. Thank goodness for my dear husband too! Not only does he show me what it is to live as The LovingKind, but life with him gives me so much inspiration for the blog! Living and loving in marriage every day, is a gift and lesson-learning machine, and I wouldn't want to live it with anyone other than my Woody. Forgive this sappy, personal moment, but, thank you, babe, for loving me, cheering me on, and being so darn adorable. I love you. And, to readers and followers of The LovingKind, THANK YOU! You can't even imagine how much joy I receive by sharing this journey with you. Whether you've been here from the beginning or are visiting for the first time today, every time you read, comment, like or message, I get the biggest smile on my face. It is truly an honor to welcomed into your hearts, your homes and your computer screens to share a little piece of our lives together. I look forward to the next year of growing of loving alongside you! As a tribute to the first year, I thought it'd be fun to recap some of the best moments and top posts of the past year! We'll start right where it all began with the first blog post, "So This Is Love" on Valentine's Day 2014. 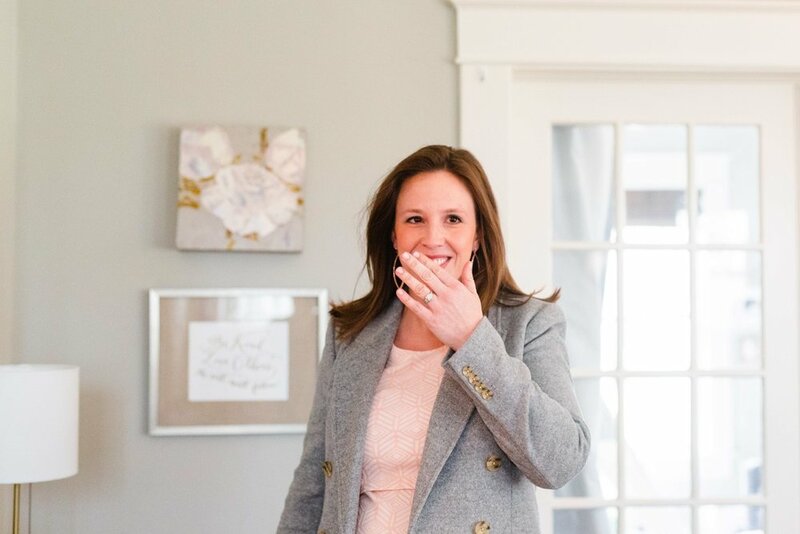 In February, I also shared what is still one of my favorite posts to date, and a great resource for brides (or anyone helping to plan a wedding), The Focus 3 (part 1 and part 2). Maybe part of the reason I love it so much is because I got to share some of our gorgeous wedding photos by the talented Sarah DeShaw! March celebrated Woody's birthday, I was part of a fun "What's in my bag" feature with Sunshine Magazine, and I shared our proposal story and proposal video on National Proposal Day! This video was one of the best surprises of our lives, and I can only imagine how remembering this moment will get sweeter and sweeter throughout the years. The spring led to thoughts on purpose, wondering about the common statement that the first year of marriage is the hardest, and some helpful feedback regarding finding the right wedding photographer. In June, I shared one of the most popular posts of the year, "Selecting Heartfelt Bridesmaid Gifts." I loved selecting gifts for my bridesmaids and was delighted that so many people found this post helpful! June also marked the first of my Behind the Lens series featuring wedding photographers. This series got a little off track at the end of the year, and I'm excited to pick it back up in 2015! My dear friend Callie and I kicked off our Luv Cooks + The LovingKind collaborated posts in July, and I shared some thoughtful reflections on marriage and commitment that I learned back when Woody got his wisdom teeth out in 2013. Stir fry in the city with Luv Cooks! Yes, I got permission to post this photo! August was a big month! 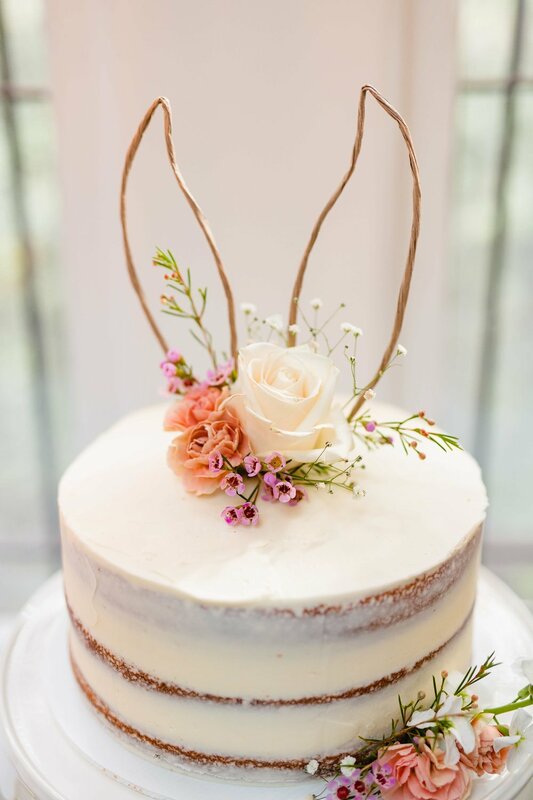 I turned 29, we were featured as a Southern Wedding Southern Newlywed, and the love journal post was another favorite with readers! September and October were a little quiet on the blog as I worked hard preparing to launch my Christmas card collection. In the meantime, I shared some of my favorite online places for you to visit and also the second post with Luv Cooks! November was one of my favorite months of the year! Not only did Woody and I celebrate our second anniversary at Disney World, but I also launched the The LovingKind Shop! The first products available in the TLK Shop were Christmas cards, and I absolutely adore this video created in partnership with Nicholas Keaton sharing the vision behind this first product collection! I did not anticipate how fulfilling and wonderful it would be to have people order the TLK Christmas cards and use them to send holiday cheer. I know how much I love when I find just the right card or product, so helping to bring this to others was really special. I even received one in the mail from our newlywed friends, RJ and Kayla! December was a great completion to a full year, and I finished it out with a personal favorite post about my two-year marriage lessons, and a festive recap of our New Year's Eve party from the year before. The New Year started off in a great way for our family and for The LovingKind! In January, I shared my 2015 goals, the first of a regular, monthly post with goal progress updates and new goals for the month, and the response was incredible! 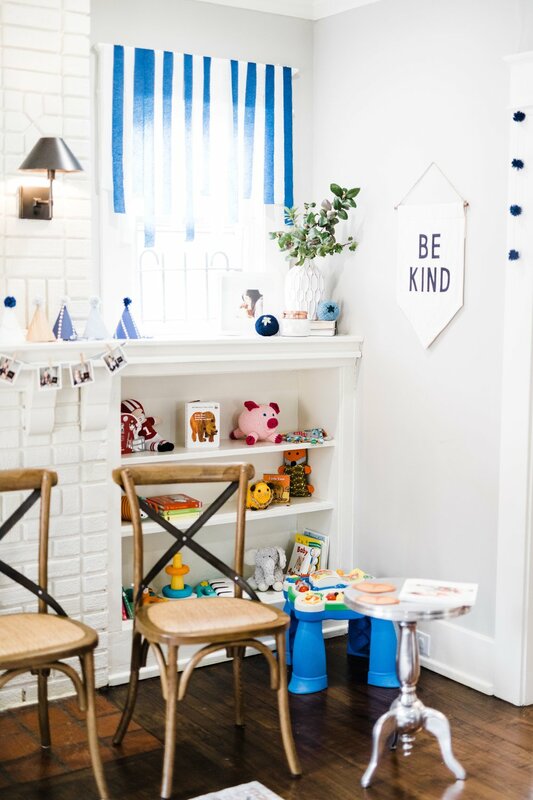 This included a fun giveaway of some of my favorite Making Things Happen products from the Lara Casey Shop, and it was the most commented on post ever for the TLK Blog! I was simply giddy getting to learn about your goals and meet new friends. I also shared about some thoughts and tips on marriage and money in January, and then came the exciting launch of love + Valentine's cards in the TLK Shop! Valentine's Day is my favorite holiday, and I had so much fun creating these cards celebrating love and friendship. The best part has been seeing which cards people pick out for the ones they love (and of course sending some of my own)! And that brings us to now! 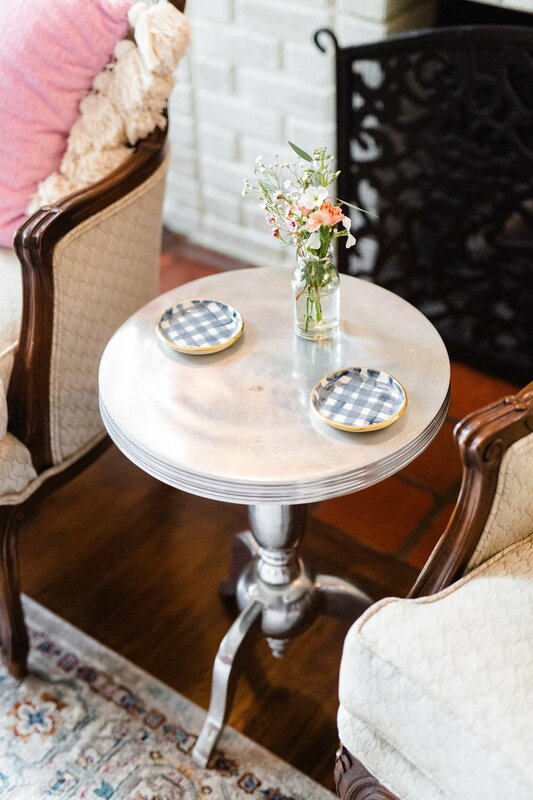 Another goals post went up to kick off February, and Callie and I shared our favorite collaborated post yet—a sweet Valentine treat! As for the rest of the month, I'm excited to celebrate a meaningful Valentine's Day with Woody (one of my February goals), and put a fun, behind-the-scenes post on the blog! Sneak peek of Behind the Scenes post! It's safe to say the first year of The LovingKind was pretty special. I grew and learned SO much, and experienced enormous amounts of love through it all. What's to come for 2015? You can count on continued goals posts, more marriage and wedding-related content, new collaborations, and more products for sure! Beyond that, I'm excited to see the good plans the Lord has, and I'm going to continuing creating and spreading love. Thank you so much for reading and sharing, and most of all for being The LovingKind! 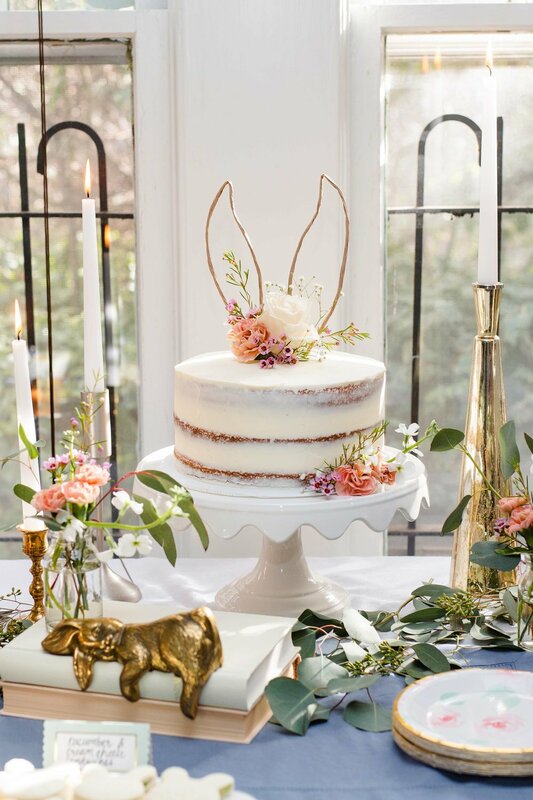 Photos in this post by Jacob Blount, KLP Photography, Rachel Coffey, and Sarah DeShaw. Valentine's Day is almost here, and I for one am loving this sweet season! 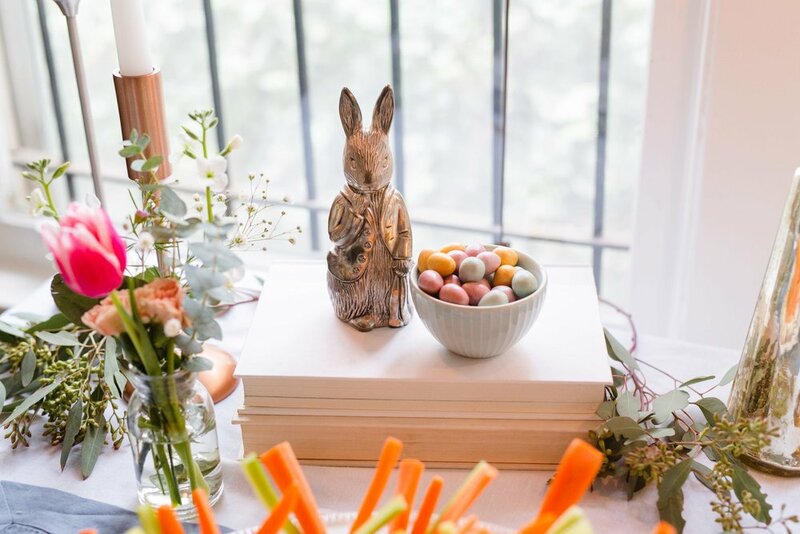 There are so many good ways to celebrate, and I am excited to share one with you today through a special treat! Strawberry Swirl Marshmallow from Luv Cooks, Happy Valentine's Day card from the TLK Shop, Mug and linen from West Elm, Pink Hot Chocolate from Sur La Table. For those of you who have been visiting The LovingKind for a while, you may recall that I am a cook-in-training. I choose not to claim that I am "not a cook" or a "bad cook" so "in training" seems to fit the bill! 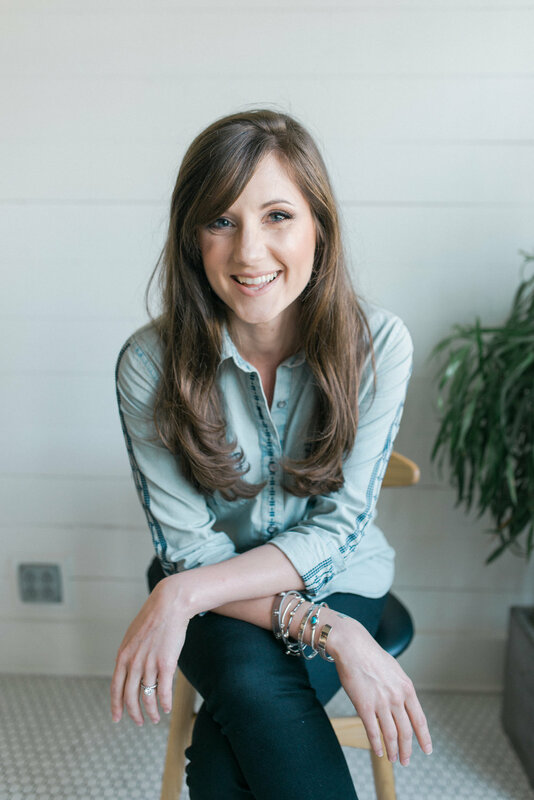 This is why I decided to team up with my fearless, cooking friend, Callie of Luv Cooks for a series of collaborated posts (see posts one and two on The LovingKind, and one and two on Luv Cooks)! I love the way Callie cooks because she is brave to constantly try new things, and she always includes the most important ingredient in any recipe—love for those she is serving. I've seen this shine through in her "honeymoon inspired" chocolate pomegranate cookies she brought to our cookie swap, the handmade caramels she gave as favors at her NYE/wedding celebration party, and the skillet-baked cornbread she made for a weeknight dinner with friends. Not to mention, Callie loves Valentine's Day just like I do, so the focus of our third installment was obvious—a Valentine-worthy celebratory treat! I hope you will feel Callie's heart and sparkle come straight through the screen, and also check out my post for Luv Cooks! True love, they say, is a "many splendored thing" (cue Andy Williams). Love in the kitchen, I say, comes in many splendored, shapes and sizes. It looks like slow-simmered, homemade chicken broth, carefully watched into the wee hours until bones and onion are discarded, then stirred into carrots and celery; noodles boiled al dente, chicken shredded and topped; served steaming to the one who needs to be soothed. It looks like a crazy day, schedule full to the brim, halted when the one who makes your heart skip a beat walks in the door with just the spice you needed. It looks like early morning scrambled eggs, whisked with gusto, while French press coffee fills the cool morning air with velvety richness. To me, love also looks like a wooden spoon. Ironically, and of all of my kitchen tools, they are the first to show the stains of recipes gone by- smudges of sauce, caramelly burnt sugars, lowly hot water spots. But they are by far essential for oh-so-many kitchen tasks—sautéing vegetables; guarding a boiling water pot so it doesn’t overflow; scraping browned bits off the bottom of a braised pan. My beautiful sister Caroline actually gave me my current favorite wooden spoon that she had monogrammed just for me. It’s luv cooks logo reminds me of the intention and care she put into buying it for me every time I stir. But for those of you looking to purchase your own wooden spoon, I adore sturdy, well handled varieties that stand the test of time. This olive wood version at Williams Sonoma is spot-on, but bamboo is also a solid option, as these tools tend to be lightweight and more flexible. Birch wood can be an excellent choice too! In this recipe for marshmallows, a well built wooden spoon is key to the best marshmallow experience you can have. Make sure you watch your sugar mixture and stir it frequently so the sugar dissolves. Then, stifle your desire to stir as your mixture reaches the perfect boiling point (240 degrees). Finally, the stirring comes full circle as you fold in your egg whites. Its a beautiful, stirring process (wink wink). All in all, the wooden spoon may be the most loved kitchen tool I own. Yet, it really is the one that shows wear the most. It hit me a few days ago that maybe that’s how real love actually is- messy sometimes; but always steady; always helpful; always solid; always beckoning us to stir more deeply into the good that awaits. May you enjoy this sweet treat, and this sweet week, with the ones you luv. Spray the bottom and sides of a 9x13-inch baking pan well with cooking spray. Scoop about ¼ to ½ cup confectioners’ sugar into the pan and toss the sugar around to coat the top and sides of the pan, discarding extra sugar. In a large bowl, pour ½ cup cold water over the gelatin. Let it sit for a few minutes to soften. Put halved strawberries and sugar into a blender to sit while you prepare the marshmallows. In a heavy saucepan, cook the granulated sugar, corn syrup, remaining ½ cup water, and salt over low heat. Stir the mixture with a wooden spoon until all of the sugar is dissolved. Increase heat to medium, and bring the mixture to a boil. Cook without stirring the mixture until it reaches 240 degrees on a candy thermometer. Remove pan from heat, and pour sugar mixture over gelatin mixture (don’t worry if you now have a gelatin dome- just keep blending), stirring until dissolved. Beat mixture with a mixer on high speed until fluffy and tripled in size, about seven to ten minutes. Once it gets so sticky that your beaters aren’t really working anymore- stop there! In the bowl of a separate stand mixer, beat egg whites until stiff peaks form, about 2 minutes. Beat in vanilla and almond extract. Add egg white mixture gently into the sugar mixture with your wooden spoon until combined and still fluffy. Pour the mixture into prepared pan, using an oiled spatula (or spoon) to spread the mixture evenly. Make the strawberry puree: Blend the strawberries in blender until smooth. Use a wooden spoon to dallop strawberry puree in center, then corners of pan. Using a toothpick, make a pretty swirl pattern, gently combining the strawberry puree with the marshmallows. Chill in the fridge for a few hours and up to a day. I found it helpful to spray a piece of plastic wrap with cooking spray, then stretch it over the top of the marshmallows. To remove the marshmallows, run a knife around the edges of the pan. Cut marshmallows in to a grid of your desired size. Use a spatula or knife to remove. Enjoy! We decided to bag up a few of our marshmallows to share with friends! Hi, You card from the TLK Shop. As you can see, Mattye and I fully embraced the celebratory nature of Valentine's Day treats with a fun white and dark chocolate dipping station! All you need is some melted chocolate; we melted Divine 70% ginger chocolate bar and white baking chocolate. Once dipped, sprinkle the mallows to your heart's content (we loved the Valentine-themed sprinkles from Sur La Table)! This is the one case where double-dipping is officially allowed! Good Pickin' card from the TLK Shop. Also, if you have extra strawberries from the puree, they are great for chocolate and sprinkle dipping too! New love + Valentine Cards available in the TLK Shop! I have always loved greeting cards. They combine two of my favorite things—words and illustrations. In fact, as a little girl, I used to create cards for my parents on the regular and even started my own card "business" drawing custom cards for all my parents' friends (think: Lemonade Stand—Hallmark edition). I don't know what it is, but there is something about those sweet pieces of folded paper and their messages of love, thoughtfulness and celebration that I just adore. Knowing this, it comes as no surprise that when I set out to create products for The LovingKind, a card collection was the obvious starting point. The TLK Shop had a great launch at Christmastime, and with the my favorite holiday, Valentine's Day, right around the corner, I knew the next opportunity was to release some designs I had been dreaming up for a while. Some of these ideas have been sketched out in my sketchbook since before the launch of The LovingKind, and I am jumping-off-my-seat excited to finally get to share them with you!! I hope you love these cards as much as I do, and more importantly, I hope they inspire you and help you show the important people in your life that they are loved. From a classic "Happy Valentine's Day!" greeting to a playful "Love is the Jam" card, this collection is created to make you smile and to make celebrating those you love easy and enjoyable. Each card is created from my hand drawn illustrations and hand lettering. My dear friend, Michelle of Parapalla Design Shoppe, helped me get my illustrations turned digital to be printed for you! And, I couldn't be happier with them! The illustrations just come to life printed on 110lb smooth ultra white paper and paired with a colorful, coordinating envelope. All they need is your personal message of love and celebration and a stamp to make someone's day! And, these cards aren't just for Valentine's Day. If you ask me, every day is a reason to celebrate love and the people you care about, so choose your favorites and use these cards throughout the year! They're perfect for saying "I love you" to your sweetheart, "Congratulations" to a newly engaged friend or bride and groom, "Happy Anniversary" to a couple you love and admire, or just "You're awesome" to a good friend. Whether you pick up one card, a few, a collection, or just browse through them, I hope they bring so much love and cheer into your life and relationships! As always, thank you for visiting, for reading, and for being The LovingKind!